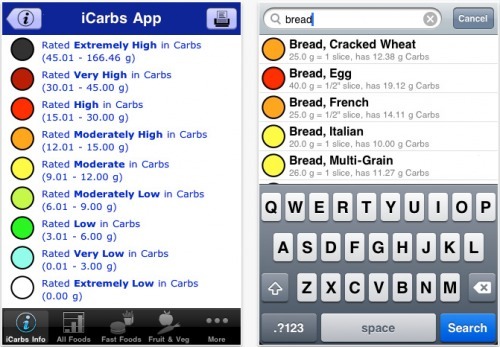 Independent developer James Hollender has released version 2.4 his "iCarbs - iNutrients: Carbohydrates" app for iPhone, iPod touch and iPad. The iCarbs app allows users to easily find out how many carbohydrates there are in over 1,100 different food servings which is critical information especially for diabetics who need to restrict their intake of carbohydrates. The new version allows for keeping track of personal carbohydrate intake and the ability to backup and restore the personal information. The All Foods table includes a search capability to quickly find food servings you are interested in. * Common Measure, e.g., 1/2 cup, etc. * How to Use this App - Shows detailed information about how to record the user's personal nutrient intake of Carbohydrates, how to make changes to what the user has recorded, how to backup and restore the data. * Access My Records - Provides up to a full year of recorded entries, listed and grouped by date. Users may also view each individual entry in the database. Allowances are made for deleting records, changing the date, and also changing the number of servings. * Other Important Information - Provides access to a copy of the User Agreement, and links to communicate with the developer about bugs, suggestions or comments. There is also an iAd Sampler which allow the user to view up to five iAds at one time. It should be noted that the best selection of iAds comes out at the top of every hour. The iCarbs app is available in the iTunes App Store for the iPhone, iPad and iPod touch. The current price is $1.99 USD (or equivalent amount in other currencies) and can be found in the Health & Fitness & Medical categories. Promo codes are available for qualified reviewers. Please specify the website, blog or organization you represent when making your request.